Letter tracing gets really fun with lower case s. Up and down, from the left to the right. But hold on! Don’t get too free and easy. Trace carefully and make those curves nice and smooth. 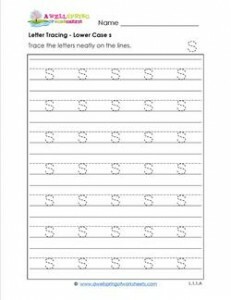 Go to this page to see all the letter tracing lower case letters in this set.